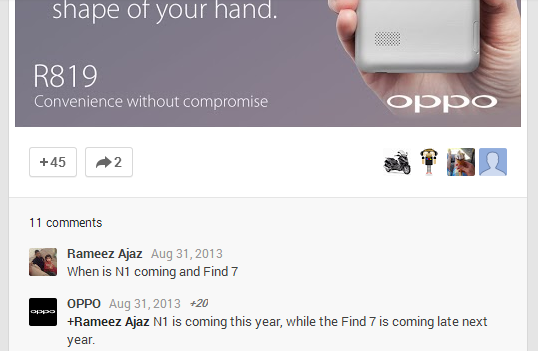 Oppo Representative: "N1 Coming Later This Year, Find N7 Coming Late 2014"
Most manufacturers tend to be coy when it comes to release dates, especially when it's customers asking rather than press or investors. But Chinese manufacturer Oppo sometimes shoots from the hip, as they did with a recent Google+ post. When asked about release dates from an inquisitive poster, someone using the official account replied with a general target release for two upcoming devices, the N1 and Find N7. The N1 was recently leaked in all its minimalist glory, and though specs are thin on the ground, it looks like a contender for a flagship device with a relatively large screen. Oppo is currently at the beginning stages of a marketing campaign for the device, possibly ahead of a reveal at IFA in Berlin later this week. A few teaser images from Oppo's Twitter account indicate a touch-sensitive rear panel and an interestingly condensed port layout, with the USB port, headphone jack, and speaker on the bottom edge od the phone. The Find N7 is mostly rumor at this point; presumably it's an upcoming sequel to the very well-received Find N5. Oppo's phone division has yet to begin full-scale distribution outside of Asia, though more than a few Android power users have taken note of the company thanks to its relatively low prices for high-powered hardware and a laissez-faire approach to customization. Android Police has reached out to Oppo for a confirmation of the above post. This story will be updated if and when we get a response.